DeWalt is a manufacturer of woodworking power tools, including table saws, miter saws, power drills, routers and more. DeWalt's miter saws include models that have the ability to bevel either to the left or right, single-bevel models (meaning that they bevel only to the left) and sliding miter saws. All of these miter saw models use a 12-inch circular saw blade. When the blade becomes dull, you can replace a blade on a DeWalt miter saw in just a couple of minutes. 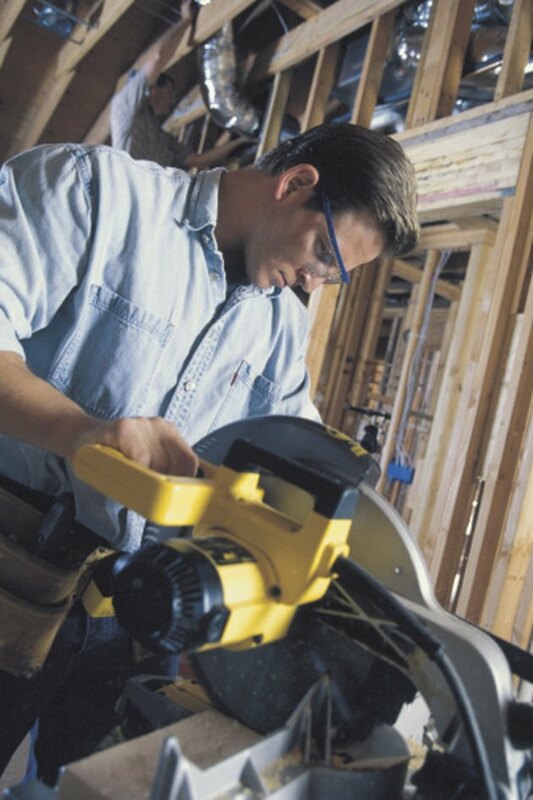 A DeWalt miter saw is designed to make straight or mitered and beveled crosscuts on wood. Unplug the miter saw from the power outlet. Pull on the locking pin and raise the miter saw's blade to the highest position. Lift the blade guard and hold it with your right hand. Locate the blade guard bracket screw (located just to the front of the saw's arbor bolt). Loosen this screw two turns counter-clockwise, and lift the upper blade guard up as far as it will move. Rotate the saw blade slowly by hand and press on the spindle lock button on the right-side of the saw blade. When the spindle lock depresses as far as it will go, the blade should be locked in place. Hold the spindle lock with your right hand and loosen the arbor bolt in a clockwise motion with your left hand on the wrench that was included with the saw. Remove the arbor bolt and outer washer, then lift the saw blade off of the arbor. Place a new saw blade onto the arbor, with the carbide teeth on the bottom of the blade pointing toward the rear of the saw. Tighten the arbor bolt and washer onto the arbor with the wrench to secure the blade. Release the spindle lock with your right hand. Slide the upper blade guard down onto the blade guard bracket screw, and tighten the screw to secure the upper guard. Allow the lower guard to cover the bottom of the saw blade. Plug in the saw and make a test cut.